Home / What should I do on the day of my tattoo? When deciding to get oneself a tattoo, it’s still important to follow a couple of guidelines to not get into the big trouble or get refused while on such a process. In turn, it makes a perfect sense to check out some of the options of what to do on the day of the tattoo-getting to ease the life for oneself and ensure that the process would be as smooth as possible. Without doing so, it’s impossible to guarantee that the artist would work to the best of his or her abilities and you’re going to get the high-quality outcome. First of all, it may be helpful to not worry too much about the painfulness of the entire process. If you get yourself distracted beforehand and think positively, everything is going to go well. 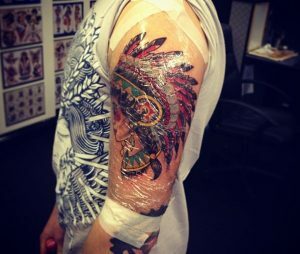 However, if doing the exact opposite, then the consequences can be quite severe, resulting in shock and unpleasant feelings during the tattoo-getting. Still, it’s all dependent on the mindset, meaning that it would not be a big trouble to solve such an issue in the short-term. Secondly, you should take care of the overall design and everything else connected to the picture you’re planning to transfer to your body. Did you print it already? Do you plan on explaining the pattern to the artist? What about the colors and shape? Truly, it’s imperative to answer all such questions before permanently carrying out something that you may regret for the rest of your life. Don’t worry, however! Everything is not that dramatic: the most proficient tattoo artists realize the needs of the clients, meaning that the outcome would be great regardless of the circumstances. Not to forget to mention the fact that you should undoubtedly take care of all the organizational matters connected to the process. Check if the parking spots are available nearby the place where you plan to get a tattoo for yourself. Also, it may be helpful to get a good meal and a drink before going to the tattoo parlour as the process sometimes may take hours to properly complete. To this end, it’s better to play it out safe and ensure the lack of inconveniences. Finally, don’t forget about undergoing the necessary hygiene preparation before getting a tattoo. In some cases, it may be must-have to abide by all of the rules and regulations because of the safety measures. For the most part, however, taking a shower should be enough for ensuring the flawless experience for both oneself and the tattoo artist who is going to be completing all of the work in the long term.